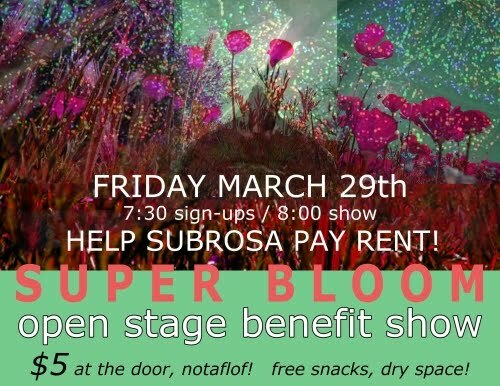 SubRosa - a community space: Tues: A Show! // Fri: Open Stage // Sat: Another Show! // Sun: Collage Salon & in p.m. Film // & More!!! Tues: A Show! // Fri: Open Stage // Sat: Another Show! // Sun: Collage Salon & in p.m. Film // & More!!! 7pm // bring $ for touring bands (notaflof) // yup! 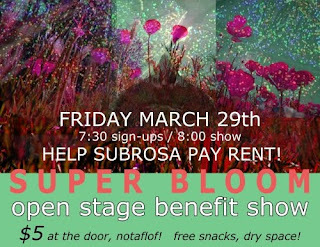 -Friday, March 29th: Super Bloom Open Stage: Benefit for SubRosa! Let us create a night to honor the beauty of becoming! SubRosa's take on Open Mic. Once a month. Every month. Only this month we are hosting a benefit show! -Saturday, March 30th: A Show!!! Wednesdays, 10:30am - 2pm // Fridays, 9am - 12pm // Saturdays, 9:30am - 12pm // Monday afternoons in April! And Saturday, March 30th, 6 - 10pm at the MAH, DIYine: A Celebration of Homebrewing (a benefit for the Bike Church) // This year the Bike Church is hosting DIYine, a DIY brewing festival. Get a chance to taste all kinds of unique homemade drinks. The event also has hors d'oeuvres and live music, and all proceeds go to support our program. Bubbling away under stairways, in closets, or in forsaken corners of the garage, all across the county an ancient tradition lives on: that sacred collaboration between man and microbe that converts sugars into alcohol. On Saturday, March 30th, the Bike Church is hosting an event celebrating this wondrous art. We are pleased to announce the seventh annual DIYine (pronounced "D I Wine"), a tasting event featuring samples of homemade fruit wines, beers, mead, and soft drinks. The event will be at the Santa Cruz Museum of Art & History downtown. In addition to being a fun event, it's also a fund raiser, with all proceeds going to support the Bike Church. Get a chance to sample some more traditional beers and wines, as well as unique items like plum port, loquat amaretto, orange blossom mead, and rhubarb-raisin sherry. We'll also have a selection of soft drinks like kefir, kombucha, and our famous Breath of Fire ginger ale. The event also includes hors d'oeuvres and live music. TICKETS are sliding-scale, $20-50 in advance, mini. $25 at the door. Buy your tickets now by following the link above.